Madame Tussauds is a world famous museum that has life like models of wax of famous American celebrities and other important historical icons. The museum sees a lot of tourists the whole year round due to its intricate wax statues and the name it holds. Visit the destination and witness for yourself the charm and grandeur of the statues that will leave you in awe. So take out some time and get to know the destination better. Book yourself a date with some of the most popular personalities in the world, during your Amsterdam trip. The Madame Tussauds Museum is a world famous museum which displays wax statues of popular celebrities from across the globe. The best way to explore the Madame Tussauds is by buying the Madame Tussauds tickets from the ticket counter, itself. If you want to ignore the long cue, then book the Madame Tussauds tickets, well in advance. You can also book the Madame Tussauds tour and get a guided tour of the museum and even click some selfies with the superstars. Take a tram or bus from Amsterdam, Dam. How popular is Madame Tussauds? People normally club together Molen Van Sloten and Vondelpark Garden while planning their visit to Madame Tussauds. Great place. Worth a visit. Expensive but I guess it is not cheap to make and perhaps even royalties paid for the characters and figures. Children loved it too. A very well-known museum. However, I have to points to raise. First, compared to London's Madame's Tussauds, this is a very small one (so try London first). Second, try to avoid crowd! because if crowded, you will definitely get stuck and will not enjoy. Overall, I recommend that you try other museums. 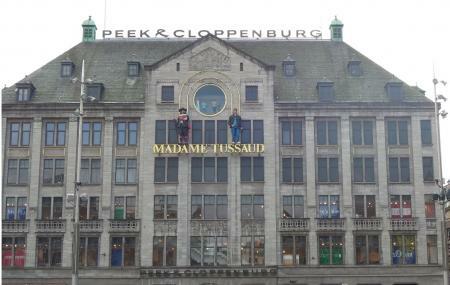 Madame Tussauds Amsterdam is the cool place to visit. It's very well organized. They also have captain marvel theme for kids and for the Marvel fans. They have nice art work and statue of lot of famous celebrity from film industry, music industry , sports industry. It was nice visit.